Juicy, crispy-skin chicken legs is a great match with nuggets of sweetness from the roasted grapes. Serve with creamy mash, carrot and swede mash or soft polenta to soak up the gorgeous juices. 1. Preheat the oven to 200°C, gas mark 6. Preheat a large ovenproof pan or casserole over a medium-high heat. Season the chicken legs and add to the pan, skin-side down. Fry for 10 minutes until golden. Turn and cook for 2-3 minutes on the underside. 2. Set the chicken aside on a plate and add the leeks to the pan with a pinch of salt. Fry for 3-4 minutes until softened, then stir in the grapes, rosemary, stock (or wine or water) and a squeeze of lemon juice. 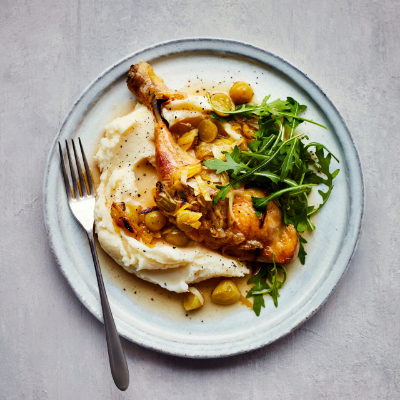 Arrange the chicken legs on top and roast everything for 25 minutes until the chicken is completely cooked through. 3. 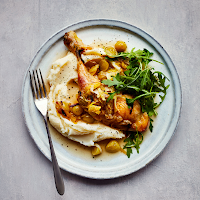 Heat the mashed potato according to pack instructions and serve with the chicken, leeks and grapes, along with any cooking juices, and a handful of rocket leaves.